Summary : Following the astounding success of "Meteor Garden," F4, all four of them together, are back with a hot new TV series "Come to My Place." Also starring Valan Hsu and Tien Hsin. Yi-Shin was suffered by her heart disease since she was born, and hardly attend any activities in school, none of the class-mates gets alone with her except one little boy Li, Chin-Tswan, friends were all teasing at them saying that they were in love.... But, Chin-Tswan's family decided to immigrate to United States, the day before they leave, Chin-Tswan brought Yi-Shin to his secret garden that he had never brought anyone into. He gave Yi-Shin a bottle full with Lavender scent, promised that he will come back for her 20th birthday. Summary : Feelings of romance and young love will take hold of you through the magic performances of Vivian Hsu and F4 's Vic Zhou & Ken Zhu! As always they sweep a passionate tender breeze your way in the emotionally loaded TV series " Love Storm" that no true fan should miss! Summary : The Marmalade Boy Drama, or Orange Jam Boy, or Ju Zi Jiang Nan Hai, is based off the popular anime/manga by Wataru Yoshizumi. It generally follows the story, moving at a slightly faster pace. The story begins with Miki’s (Guangxi’s) parents, the Koishikawa’s (the Xiao Shi Chuan’s) deciding to get a divorce and remarry by swapping spouses with a couple, the Matsuura’s (the Song Pu’s), they met on their trip. Miki is enraged and begs for them to stop this. She gains a little hope that the other couples’ son could potentially help her convince them otherwise. Miki is surprised at how Yuu (You), the son of ths Matsuura’s is very cute. She remembers her purpose though and at the table demands that they stop this. She says that it is unfair to her and Yuu, but Yuu says that he doesn’t care. Miki is even more angered and tries to ignore her family. The two families decide to live together so they kids will get to still be with both parents. And so their story beings. A Must-See for Ken Zhu's Fans. Summary : Asia's most popular group F4's Vic Chou continues the ideal romantic pairing with Barbie Xu beyond Meteor Gardens II, in the extraordinary new Taiwanese drama, MARS! An adaptation of popular Japanese manga MARS, the television series is directed by the acclaimed Cai Yue Xun. Vic plays two characters, a pair of identical twins with an exploding dark, tragic passion. Zero is reckless, brutal and passionate, losing himself in the speed thrill of motorcycles. Saint on the other hand is quiet and reserved, lives in satisfaction and peace, delivering his passion into drawing. They are a pair of loving brothers until the arrival of Saori, and when Saint cannot accept the fact that Saori loves Zero, he committed suicide. Zero is destroyed by the guilt of Saint's death, and ended up in a mental instituation for two years...until the arrival of Kira (Barbie Xu), who managed to find the deepest wound buried in Zero. Kira suffers from autism after a traumatic event from her childhood, can she discover the most beautiful thing in the world, love, again? The production for the series is taken very seriously, and shots for the thrilling motorcycle racing is shot on location in Japan. 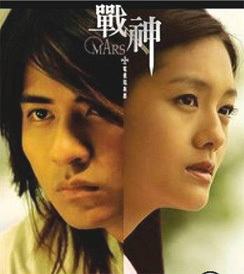 Both Vic and Barbie received rave reviews for their performances, and with other young stars in support, MARS is undoubtedly one of the best Taiwanese television shows of 2004! Summary : San Cai (Barbie Hsu) is a poor girl studying in Ying De University, an elite university with rich students in glamorous lifestyle. Her parents insist and had worked very hard in order for her to be able to study in that university, in the hope that she will find a rich husband. However, San Cai feels so uncomfortable studying in that university. She feels disgusted with the glamorous lifestyle of the students and their arrogant attitudes. A group of guys called the 'F4', hold a lot of power as their parents are the owners of the university. No one dares enough to go against the F4, if they do, they'll be red-tagged and forced to drop out from the university. Even the lecturers are afraid of them. One day, San Cai manages to offend Dao Ming Shi and the action begins to hot up! Summary : This is the continuation of the popular Meteor Garden series. The story happens in Spain where the love pair Jerry Yan and Barbie spend their high-school graduation trip. Unfortunately, Jerry loses his memory after a car accident and meets Michelle, follow this exciting series that promises to mesmerize you from start to end. Summary : If you like the hit TV series "Meteor Garden," don't miss "Meteor Rain." 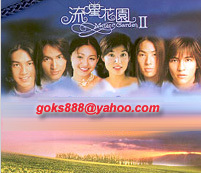 Starring popular Taiwanese boy group F4, this "Meteor Rain" VCD contains 3 special episodes. Casts : Sun Xie Zhi, Angela Zhang, Yan Xing Shu, Sam Wong, Gao Tian Qi, Wang Ren Fu, Xu Meng Zhe. Summary : Another good idol drama after Meteor Garden ! Love rivalry, basketball, beautiful cast and an interesting plot makes the whole drama fantastic! This drama has the highest viewers' rating for many weeks in Taiwan! Not to be missed! Summary : Based on a popular Japanese Anime, "Yamadataro Monogatari" is taking the island by storm. F4 Teenage idol Vic Zhou and Annie Yi starred in this popular drama series. Summary : Taiwan's hot actress Yeung Shing-lin (Xiao Yo of Meteor Garden) is back with another new series of TV drama "Tomorrow." Yeung Shing-lin and new star Shawn Yu are definitely promising artists. Also starring Fan Wei-chi, Peng Yu-yan, Gloria Yip and Li Yuan-bo. Adapted one of the most popular and long-lasting Japanese fictions "Tomorrow," the funny but moving storyline will continue to keep you hooked. See what happens to the five intimate friends in the group called "Tomorrow"?